AFLOAT: The Italian Wing before the Start. THE POWER: The mounting of the two "Isotta-Fraschini"asso 750" engines. 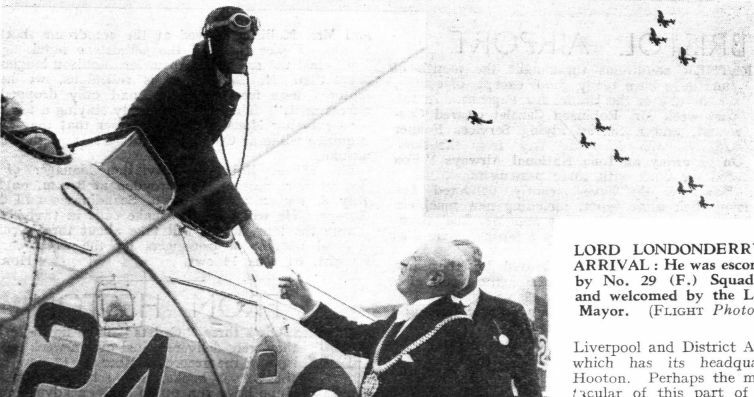 LORD LONDONDERRY, Secretary of State for Air, opened Liverpool Airport officially on Saturday, July 1. 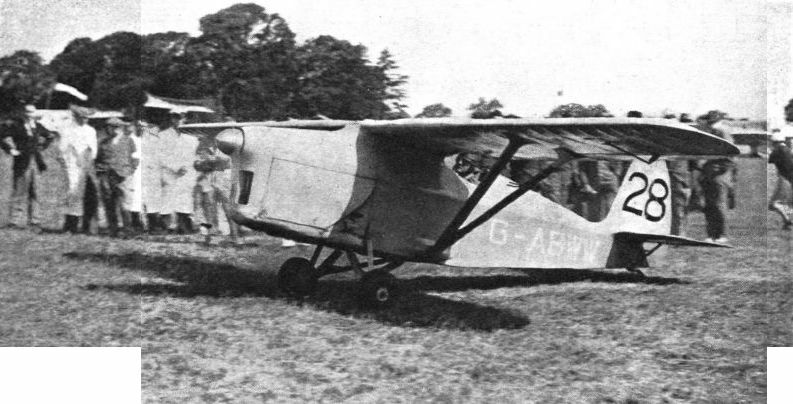 He flew to the aerodrome in a Hawker "Hart" (R.R. "Kestrel") escorted by nine Bristol "Bulldogs" (Bristol "Jupiters") of No. 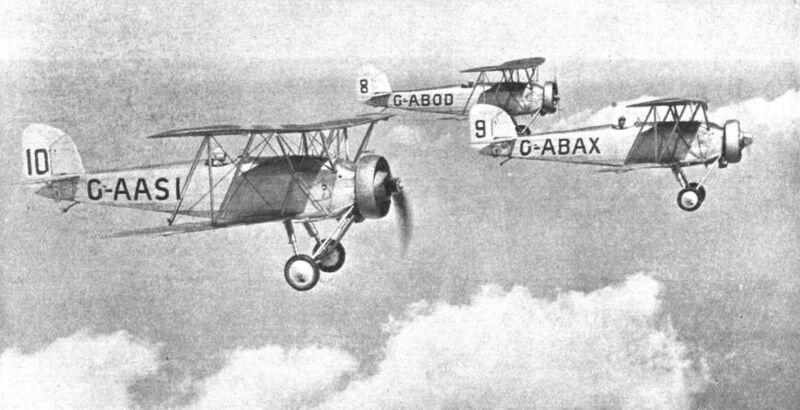 29 (Fighter) Squadron. On his arrival he was welcomed by the Lord Mayor (Councillor A. 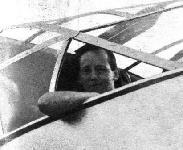 Gates), Group Capt. H. J. Hunter (Officer Commanding the R.A.F. 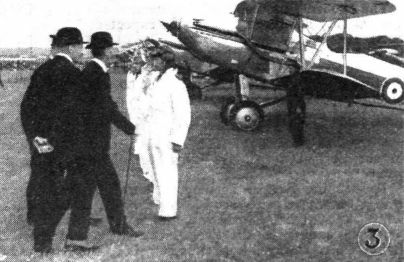 Display), and Mr. F. G. Bertram (Deputy Director of Civil Aviation, representing the Director, Col. F. C. Shelmerdine). Луи Блерио пересекает Ла-Манш. 25 июля 1909г. : установленный газетой "Daily Mail" приз в 1000 фунтов стерлингов за перелет через Ла-Манш выиграл Луи Блерио. 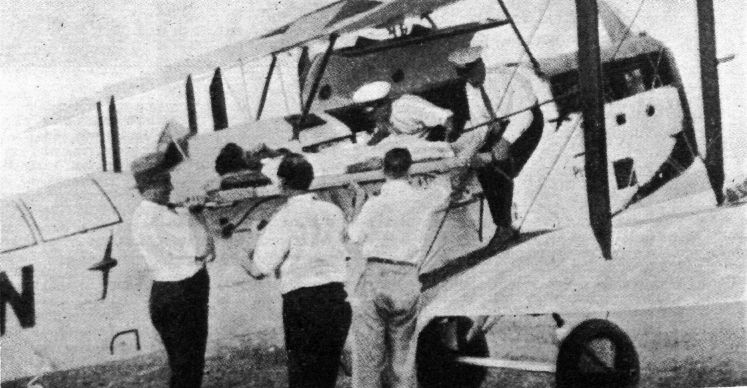 Француз взлетел на своем моноплане Bleriot Type XI недалеко от Кале в 4 ч 35 мин утра и в 5 ч 12 мин, невзирая на туман над Ла-Маншем, в котором летчик едва не заблудился, и перегрев мотора Anzani мощностью 25 л. с. (мотор охладил дождь), приземлился в Великобритании в районе замка Дувр. Ла-Манш был покорен за 37 мин. На следующий день на первой полосе британского таблоида "Daily Sketch" красовался портрет Блерио с подписью: "Плакали наши денежки". От правительства Франции Блерио получил сумму, эквивалентную 3000 фунтам стерлингов. Денежные призы позволили летчику основать собственную фирму. 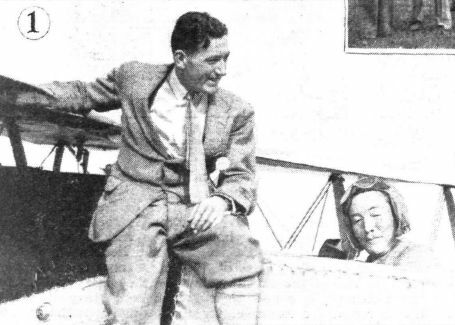 THE END OF A FAMOUS FLIGHT: As recorded elsewhere in this issue, the Mollisons, after accomplishing a magnificent flight across the Atlantic, met with misfortune - happily without very serious consequences - when landing. 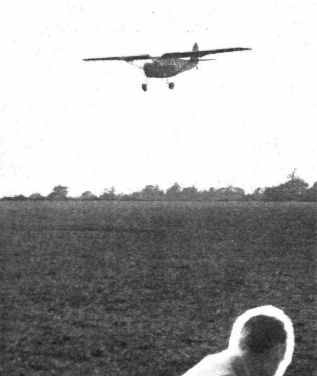 Twenty-four years ago - on July 25, 1909 - Louis Bleriot made history when attempting a similar exploit, the crossing of the English Channel. 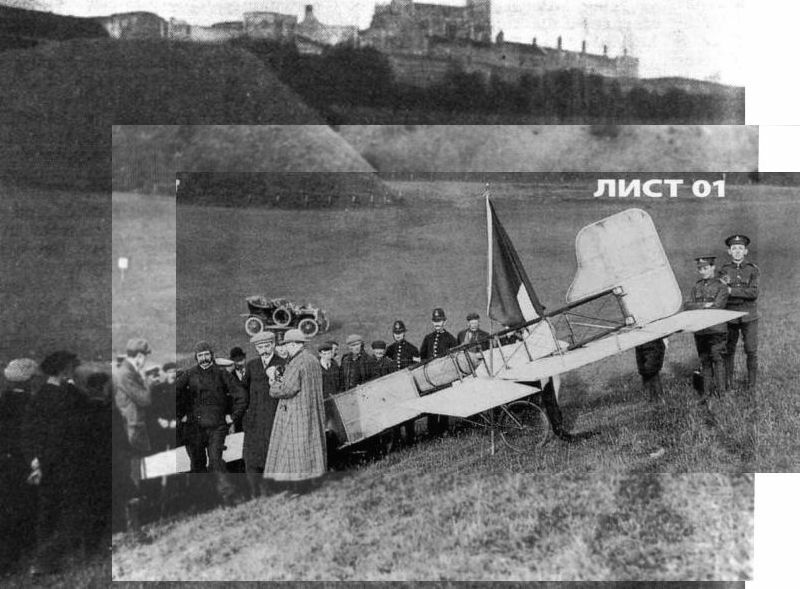 He, too, crashed on landing at Dover, as shown in the accompanying illustration. 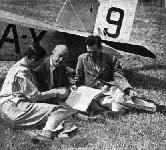 The progress made in flying since that time is remarkable when we compare his flight with the recent accomplishments of Gen. Balbo and his "Armada," Wiley Post's Round-the-World "trip," and that of the Mollisons referred to above. THE WINNER: Wing Com. H. M. Probyn won the Cinque Ports Wakefield Cup Race in this new Miles "Hawk" (Cirrus III) at Lympne on July 22. VICTORS: Fit. Lt. Ivins with his winning old Bristol Fighter, which also carried Mr. Keith Jopp. A PATIENT BEING PLACED IN THE A.I.M. AMBULANCE PLANE: A striking contrast to the Camel ambulance transport, used in the early days. "NOSE-ON": This front view gives a good idea of the small frontal area of the "Heyford." 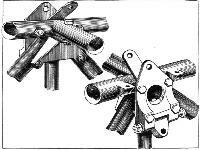 WINDING THE ELASTIC: The starting equipment is removable, and is taken from one engine to the other. 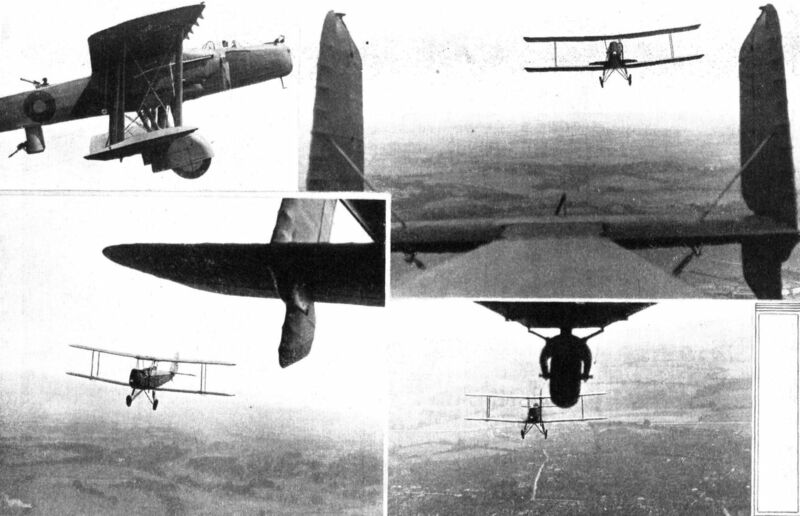 ONLY A "SPARTAN" WOULD ATTACK THE "HEYFORD": With a gunner above and a gunner below, in a rotatable turret, the new Handley Page night bomber is well defended. 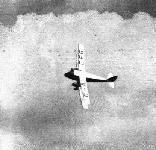 On this occasion the "Heyford" was piloted by Sqd. Ldr. T. England and the "Spartan" by Capt. Cordes. 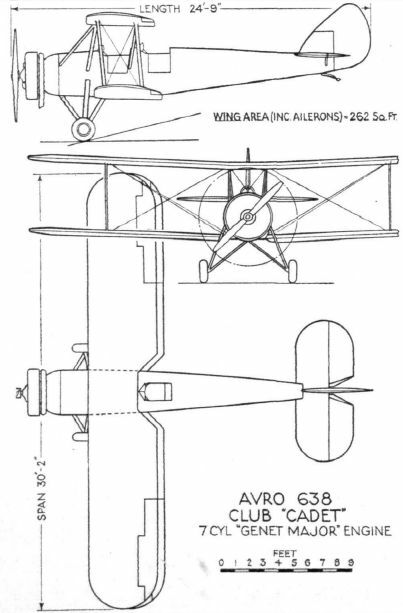 TWIN RUDDERS AND MONOPLANE TAIL: The aerodynamic horn balances of the rudders are below the tailplane, while the mass balances are at the top. 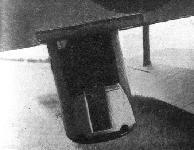 THE HINGED STERN CAP: This gives access to the tailwheel support, tailplane trimming gear, etc. 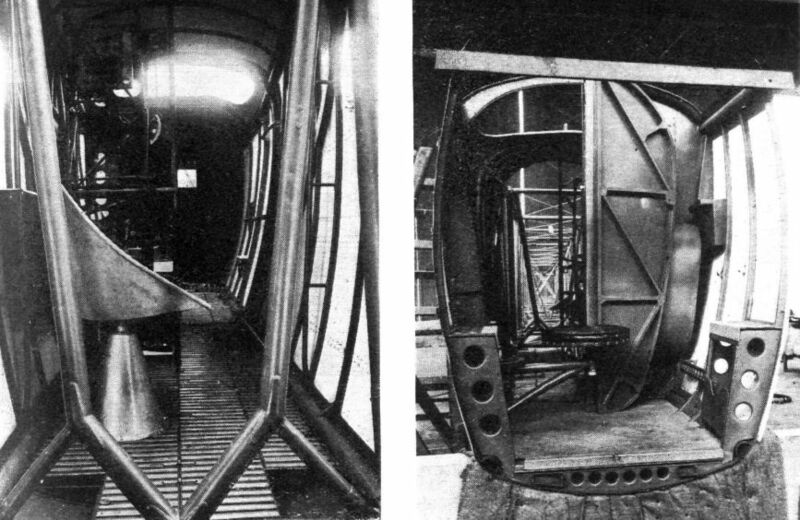 Since this photograph was taken mass balances have been fitted the elevators, and are housed inside the fuselage. 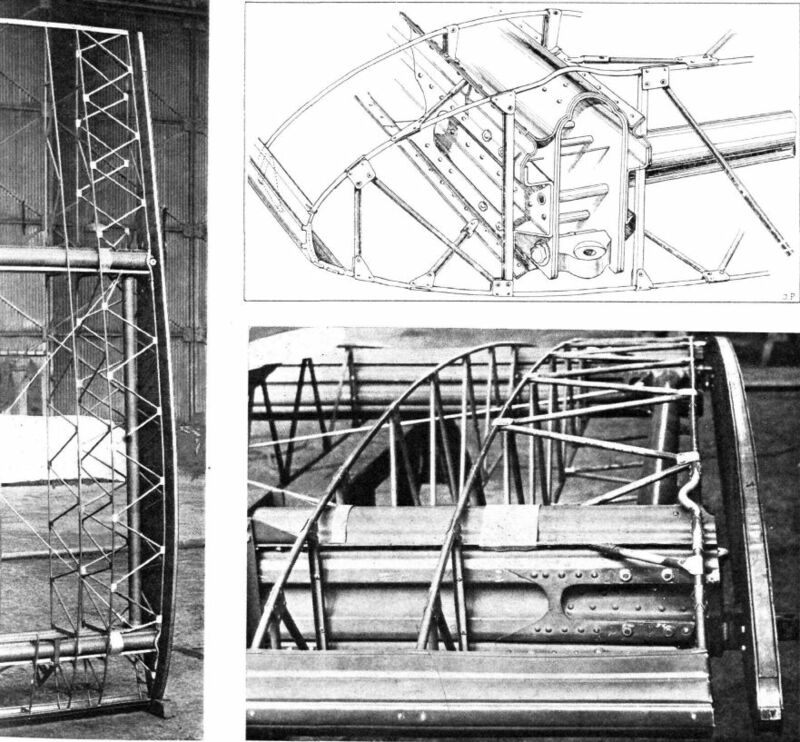 THE FUSELAGE: The front portion is a metal monocoque structure, while the rear is a steel tube wire-braced girder. INTERIOR VIEWS: These were taken before the machine was finished. On the left, the wireless compartment, looking forward. On the right, a view into the front gunner's compartment, taken before the nose cap was put on. Note the firing steps and the "piano stool" seat. THE PILLAR BOX: This is raised, lowered and rotated by the gunner himself. 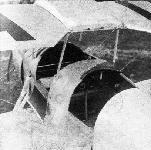 FUSELAGE DETAILS: Left, built-up longeron, metal skin and channel formers of the monocoque portion. 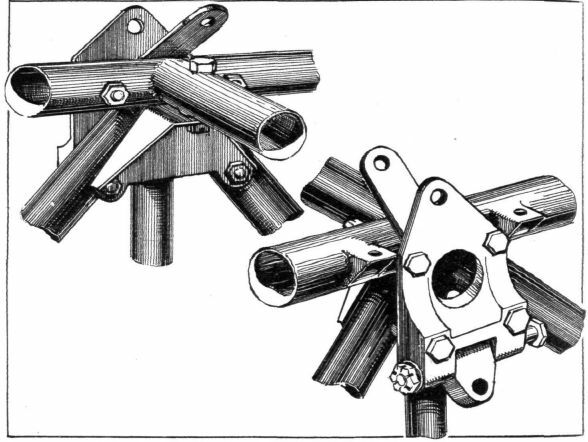 On the right, joints in the single-bay portion in way of the wings. 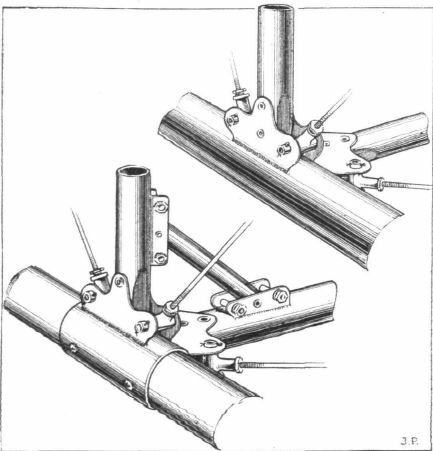 Several sleeve joints are shown. The transverse bracing is arranged to provide a doorway to the rear gunner's cockpit. 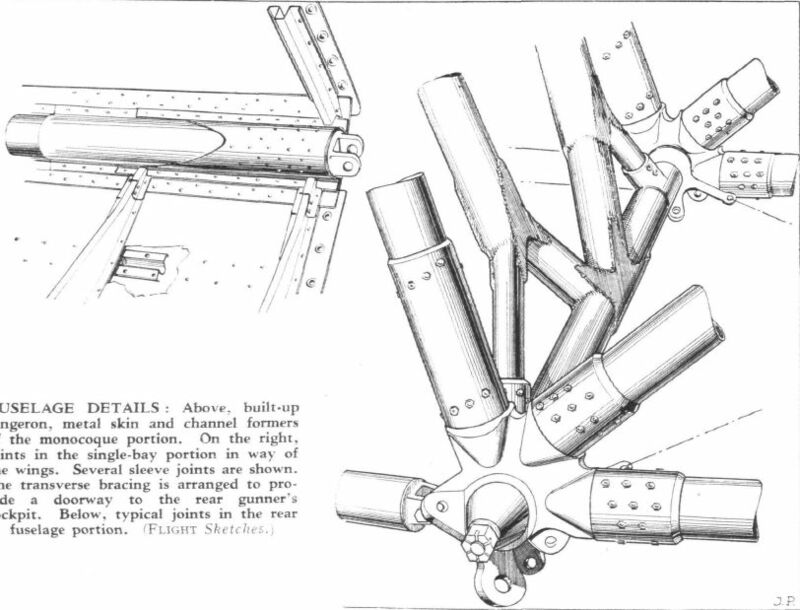 FUSELAGE DETAILS: Typical joints in the rear fuselage portion. 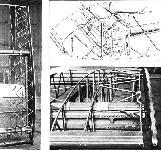 WING CONSTRUCTION: The two photographs show the general wing construction, while the sketch illustrates some of the details thereof. They relate to a starboard lower plane. 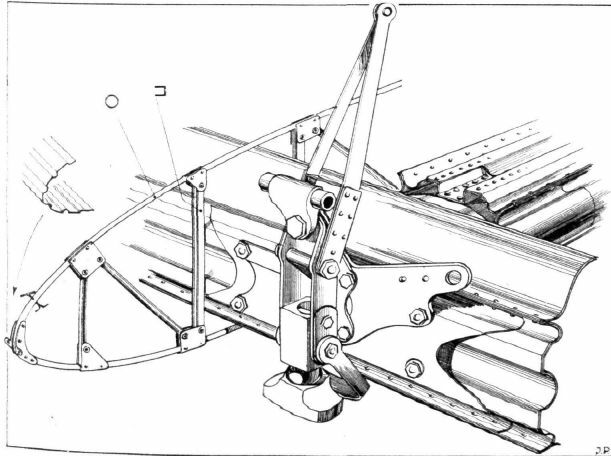 Details of an outer lower wing, with interplane strut fitting, and support for lifting jack. 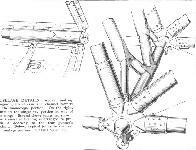 The internal drag bracing strut is of the same section as that of the main spars, but of slightly smaller dimensions. 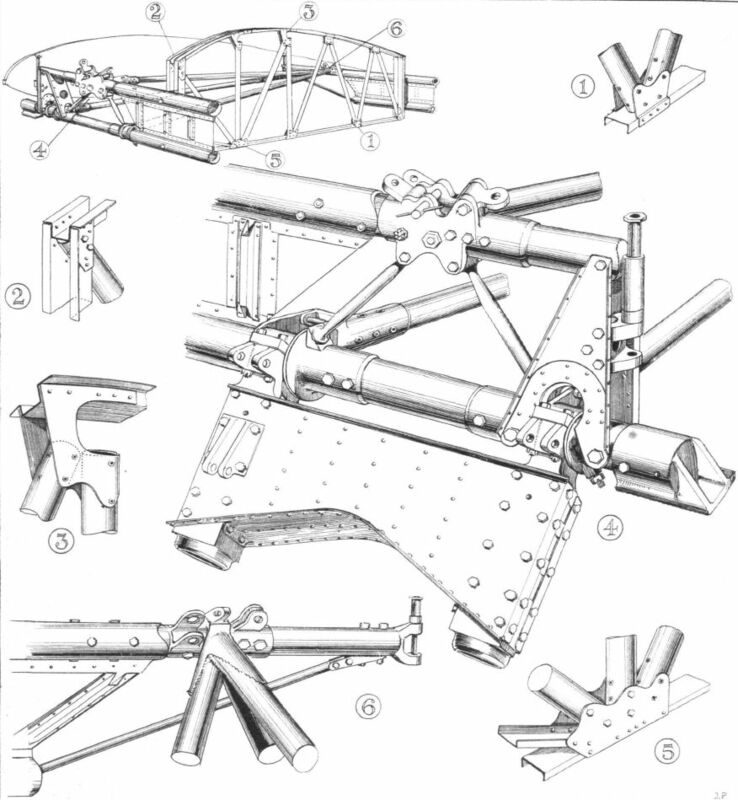 LOWER CENTRE SECTION: The construction of this differs from that employed generally in the wings. The small sketch in the upper left-hand corner shows the location of the various numbered details. The Kawasaki "88" general-purpose machine with 450-h.p. B.M.W. engine. The machine was presented by people of Ibaraki prefecture, and the Japanese name "Aikoku" means "The Patriot." The Nakajima "91" s.s. fighter, "Jupiter VII" engine. A MILLIONAIRE'S GIFT: The Nakajima "91" was presented to the Army by Mr. Kobuse, a millionaire. Wiley Post and his Lockheed "Vega" Winnie Mae. 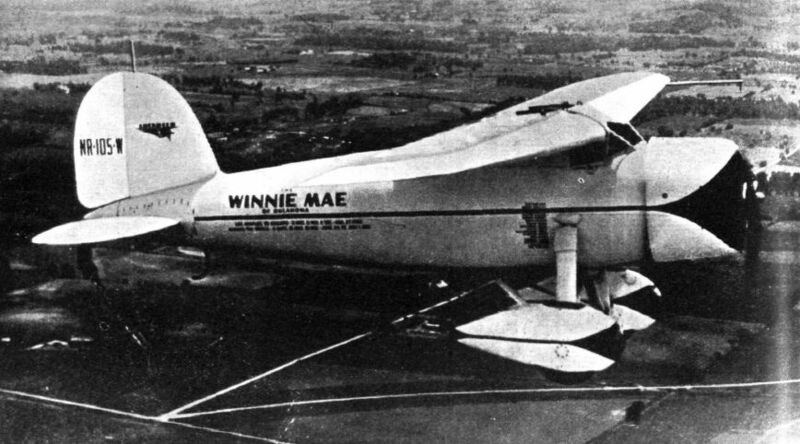 WINNIE MAE - WINNIE DID: Wiley Post's Lockheed "Vega" (Pratt & Whitney "Wasp") which for the second time has done a "left-hand circuit" of the Northern Hemisphere. His second trip was completed in 7 days 18 hr. 50 min., thus bettering his first by 21 hr. 1 min. THE TOP SILVER SIDE: Three "Tutors" from C.F.S. DEMONS: The Secretary of State for Air inspecting No. 23 (F.) Squadron. 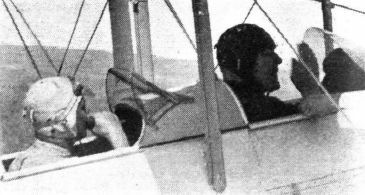 He was accompanied by Air Marshal Sir Robert Brooke-Popham and Group Capt. H. J. Hunter. IN THE NICK OF TIME: The Napier "Javelin" engine of Mr. Percival's "Gull" was disinclined to start in Heat 6, but this strong man got it going as the flag fell. THE ANGERS "12 HOURS CONTEST": Miss Helene Boucher's Mauboussin-Zodiac 17 (60-h.p. 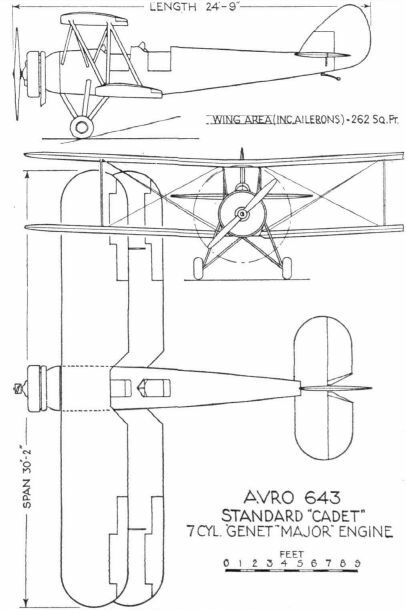 geared Salmson). 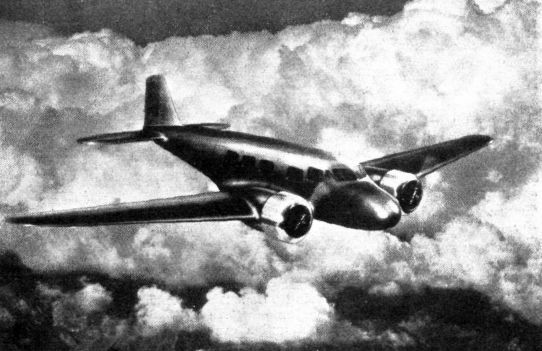 THE LOCKHEED "ELECTRA": A photograph of a model. 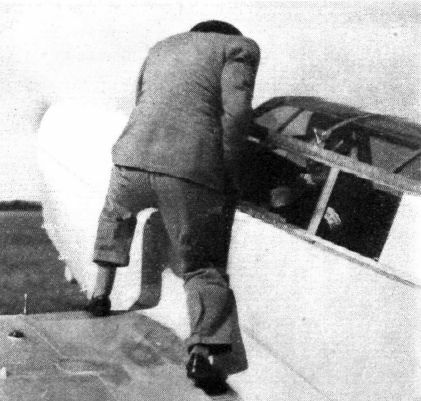 The arrangement of the cabin windows in the actual aircraft will differ from that shown here; the front windows will slope inwards in the latest American fashion. 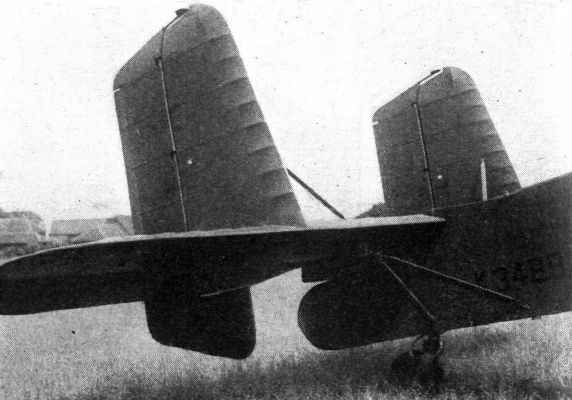 This side view of the "Waco" shows the interplane strut with a wide fairing on it so arranged that it can be rotated to form an airbrake when landing. 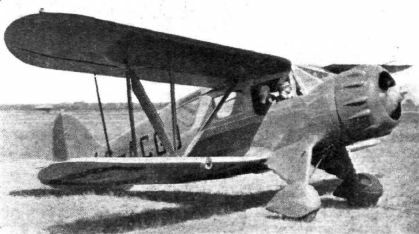 The "Waco" has large side windows which can be opened. The clean design of its undercarriage should be noted. 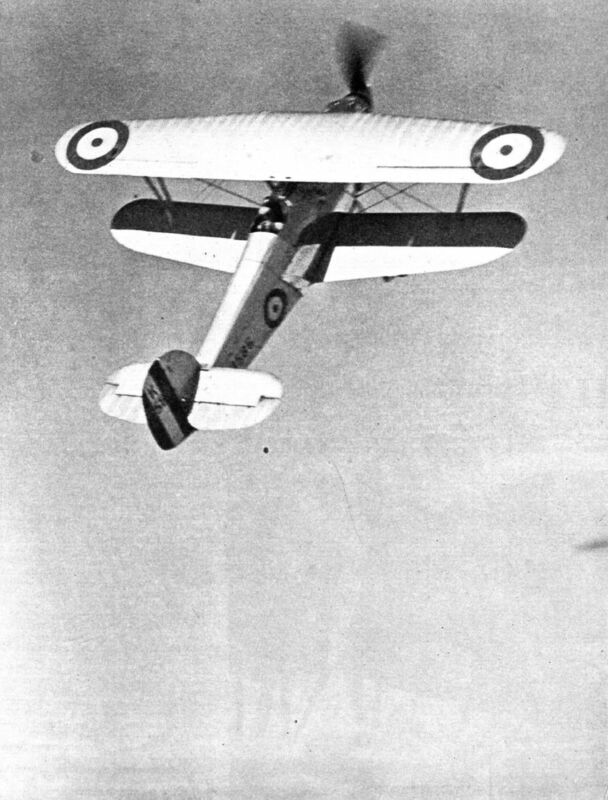 THE STANDARD "CADET": This forms the prototype of the "Cadet Family," and is characterised by a pronounced stagger of the wings. The engine is a 7-cyl. "Genet Major." A COOL VIEW: Visitors find the high diving board a good grandstand. F/O. Murray flying past in the "Cutty Sark" of A.S.T. 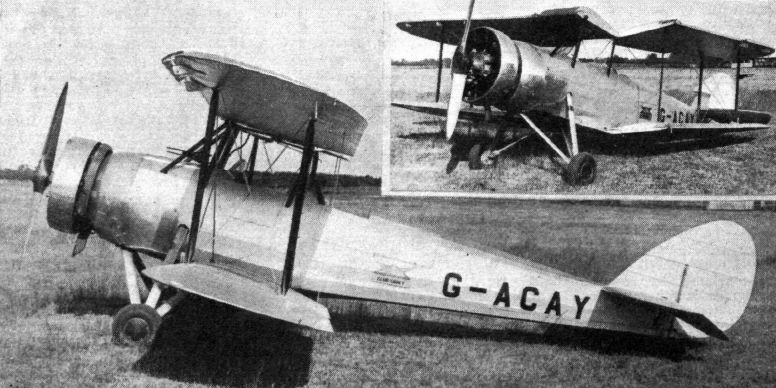 The Avro "Cadets" are also from A.S.T. 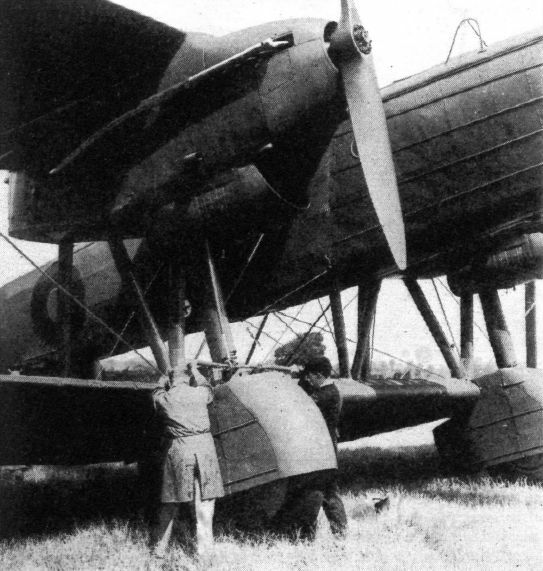 WHERE THE SHOCK IS TAKEN: The fitting which attaches the undercarriage telescopic leg to the fuselage on the "Cadets." JIM JUMPS T'OWT: J. Mollison had to start up the "Gipsy Major" engines of his Seafarer in a hurry when the tide rose at Pendine Sands last week. Here he is! THE START: Seafarer just after taking off from Pendine Sands. 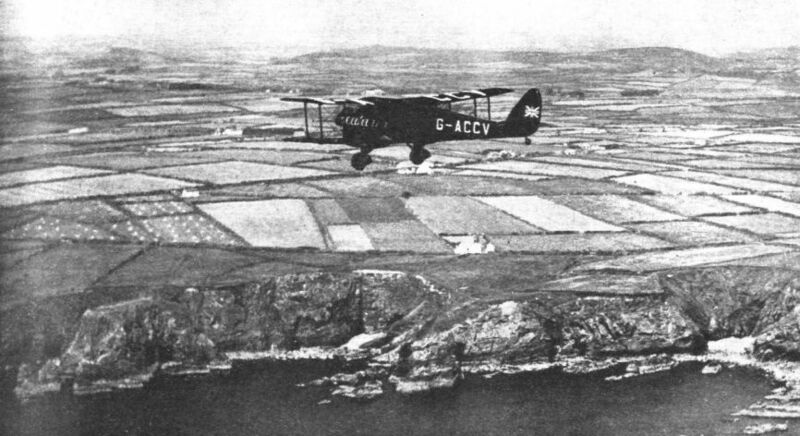 "GOING WESTWARDS": The two "Gipsy Major" engines of the Seafarer must have disturbed the peasants of this part of Ireland, as Mr. and Mrs. Mollison flew at low altitude on their way to the Atlantic Ocean. LARGE AND FAST: As it was the first time a "Dragon" had been raced its performance was watched with interest, and Capt. Broad's superb cornering (seen here) was as much commented on as were his quick circular take-offs. 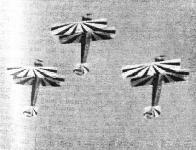 D.H. "Dragon" (2 "Gipsy Major") six seater. THE CABIN OF G-ACGG: Last week the newspapers made much of a "forced landing" made by the Prince of Wales' "Dragon" when H.R.H. was on his way to Weymouth to open the new harbour works on July 13. Actually, of course, Fit. Lt. Fielden, the Prince's pilot, merely made a precautionary landing near Swanage, as the weather was so bad that it was unwise to go on by air. 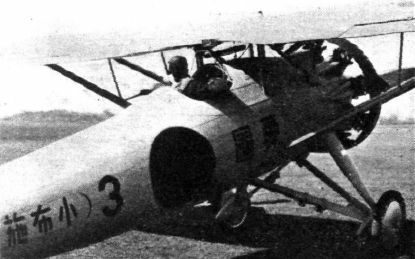 D.H. "Puss Moth" ("Gipsy III") three seater. HIGH AND LOW: Mrs. Butler ("Leopard Moth") and F/O. 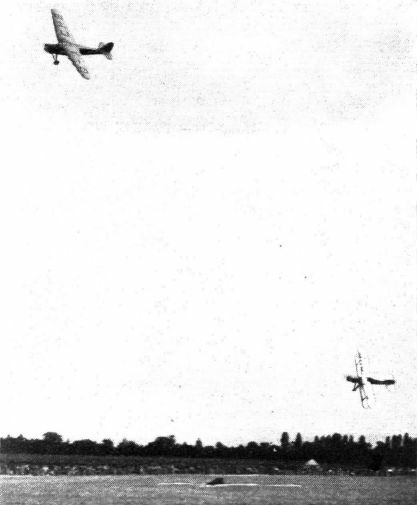 Leech (Arrow "Active") taking the corner on the aerodrome at Hatfield in the middle of the final. 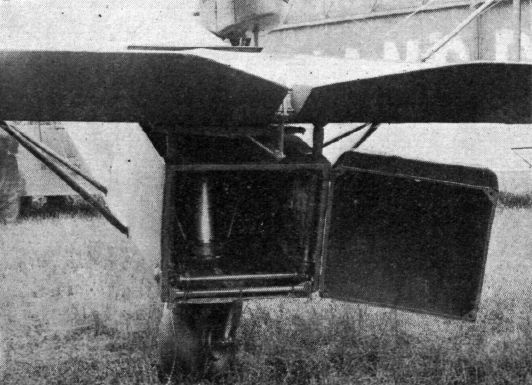 WITH "HERMES IV": The three-seater "Cadet" can be supplied with this and similar in-line engines instead of the "Genet Major." 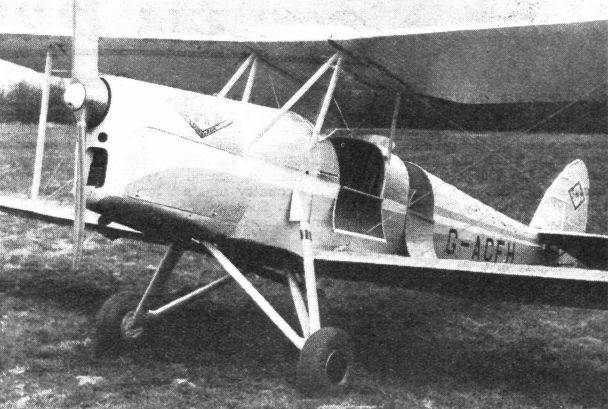 The "Cadet" three-seater or joy-riding model. This particular machine has a "Hermes IV" engine. 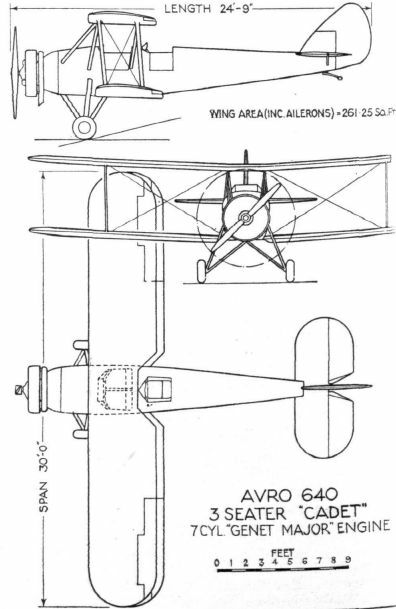 THE AVRO "CLUB CADET": The introduction of folding wings has necessitated the reduction, almost to vanishing point, of the heavy stagger of the Standard "Cadet." The engine is an Armstrong-Siddeley 7-cyl. "Genet Major." FOR TAXI WORK AND JOYRIDING: In the "Cadet" three-seater the front cockpit has room for two, side by side. 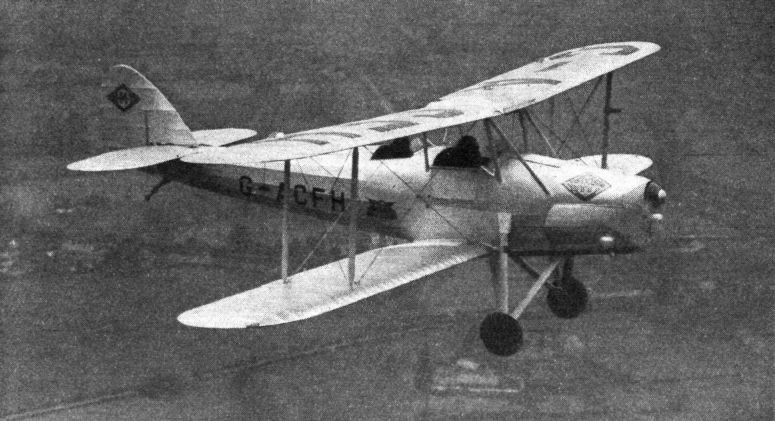 FIRST PUBLIC APPEARANCE: The de Havilland "Leopard Moth" ("Gipsy Major"). This is one of the experimental machines. Those in the King's Cup Race will have the registration numbers G-ACHB, ACHC and ACHD. For the last machine it may be remembered that "DH" is flying "HD." THIRD HOME: Mr. A. J. Styran, flying Sir Derwent Hall-Caine's "Leopard Moth" ("Gipsy Major"), crossing the finishing line. Mr. A. J. Styran flying Sir Derwent Hall-Caine's "Leopard Moth" ("Gipsy Major") in which he won the Heston-Cardiff race on Saturday, July 22. PALMAM QUI MERUIT FERAT: Capt. 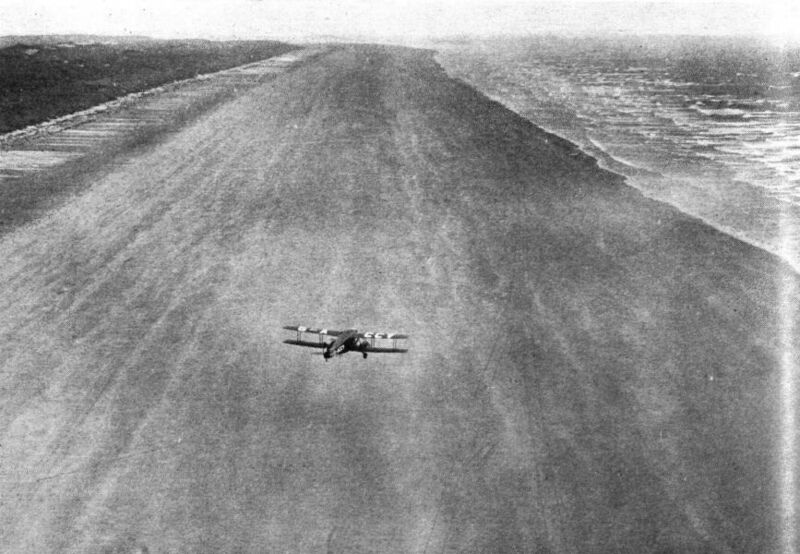 G. de Havilland is seen crossing the line to win the King's Cup Race in his latest production, the "Leopard Moth" ("Gipsy Major"). 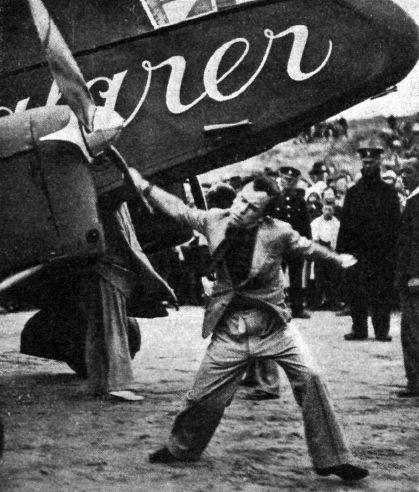 As a pioneer and the "old man" of the de Havilland Aircraft Co., Ltd., his popularity is great, and the enthusiasm with which his win was greeted was very sincere indeed. His staff are loyal and support him on all occasions. 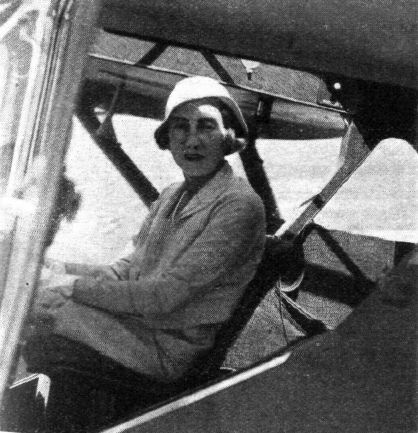 A FINE FLIGHT: Mrs. Butler, wife of the Chairman of the de Havilland Aircraft Co., Ltd., piloted a "Leopard Moth" ("Gipsy Major") with great skill throughout the Race. Mr. Butler was her navigator. THE COMFORTER: Capt. 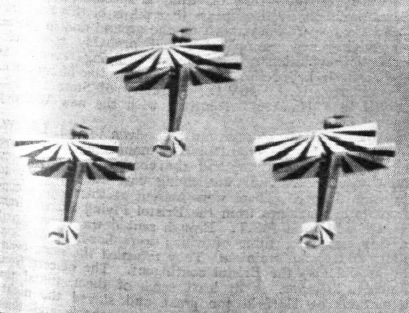 W. L. Hope derives comfort from an empty pipe when flying in the race. His "greenhouse" is shown in the open position. SCRATCH: Fit. 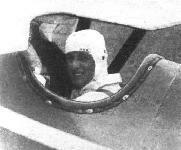 Lt. G. H. Stainforth, who made the fastest time in the race with the Coupe Deutsch "Swift" ("Gipsy Major"), starting in Heat 6 in the King's Cup Race. YOUTH AND EXPERIENCE: Mr. A. Henshaw (in white flying suit), though one of the youngest pilots in the race, flew his Comper " Swift" (Pobjoy) into seventh place, and also won the Siddeley Trophy as a representative of the Skegness and East Lincolnshire Aero Club. SECOND MAN: Fit. 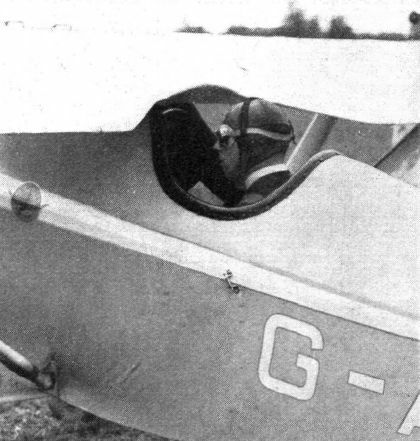 Lt. E. C. T. Edwards in his Comper "Swift" (Pobjoy) waiting to get away in the final. He flew a remarkably fine race, winning each of his heats and ultimately running into second place. 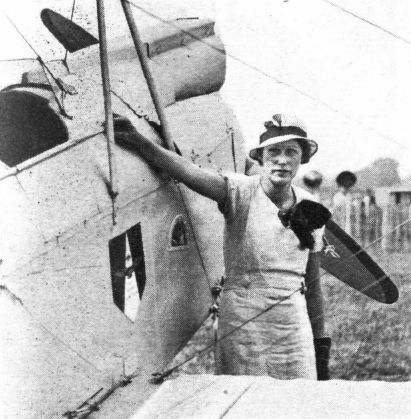 The Countess of Willingdon, wife of the Viceroy of India, disembarking at Croydon from the Imperial Airways Atalanta type four-engined monoplane at the conclusion of her flight from India. STRAINING AT THE LEASH: The line-up for the first heat of the day, at 8 a.m. THE LIMIT MAN: Mr. T. C. Sanders getting away first in the King's Cup Race. His "Martlet" ("Genet") is a well-known sporting single seater. 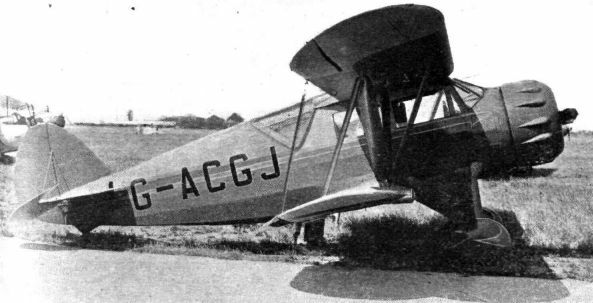 The Farman 353 ("Gipsy Major") of Maurice Finat and Miss Aleck Plunian. 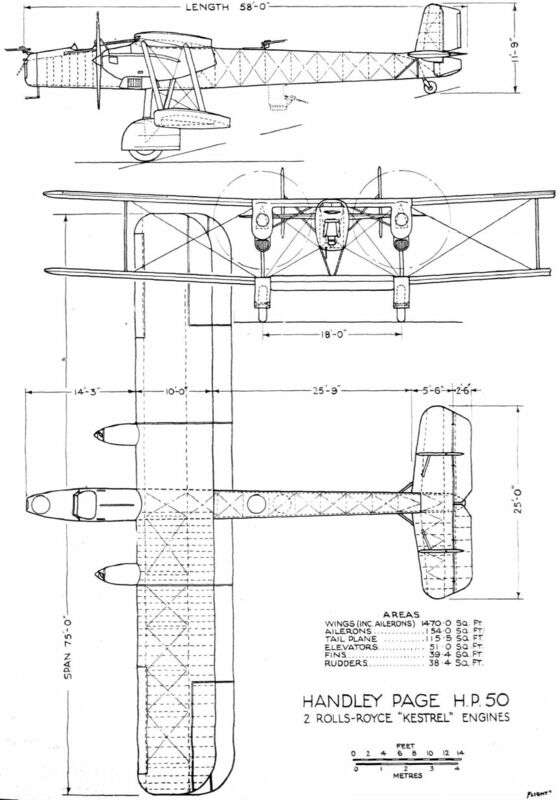 THE WINNER: The Farman 358 (100-h.p. 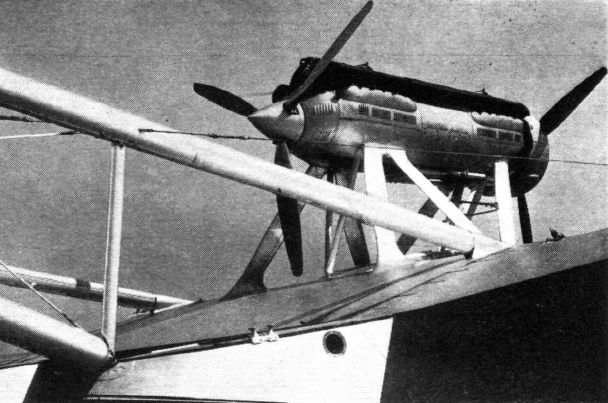 Hispano-Suiza) flown by Marcel Langlois. THE FINAL: Our veteran timekeeper, Mr. George Reynolds (right), starting the first man. A WORTHY LOSER: Capt. 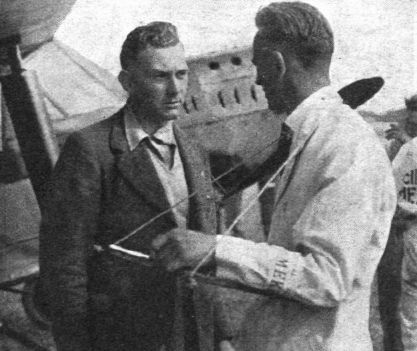 E. D. Ayre, who missed getting his three-year-old Desoutter ("Hermes II") into the final three by only 7 sec, is here seen talking to a timekeeper before starting on the final. 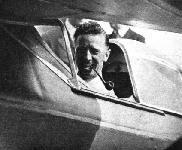 Marcel Haeglen, Commissioner-General, and his Hanriot 437 in which he will follow the Tour. 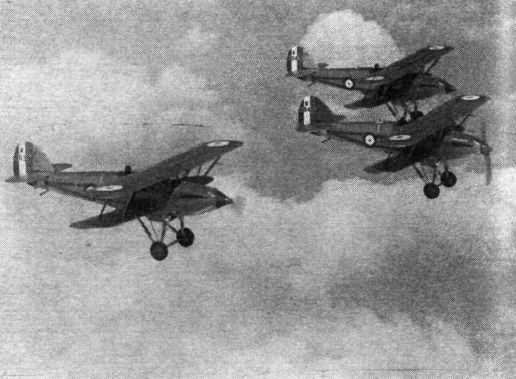 THE HAWKER-WOLSELEY COMBINATION: The three Hawker "Tomtits" trying out their new Wolseley A.R.9 engines near Brooklands before the race. THE "TOMTIT" PILOTS: Left to right, P. E. G. Sayer, P. W. S. Bulman and G. E. Lowdell. 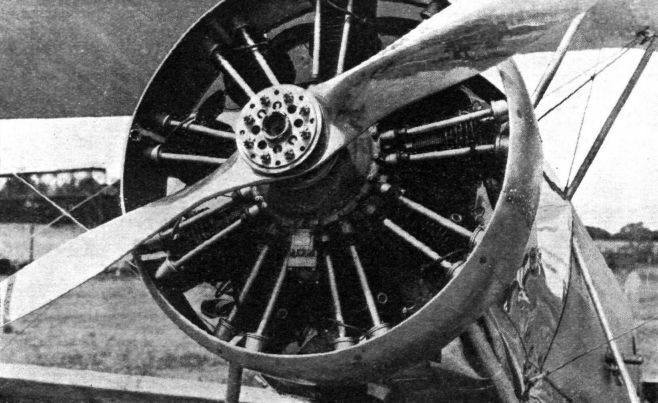 THE NEW WOLSELEY ENGINE: This is the first photograph to be published, and shows the engine in the Hawker "Tomtit," to be flown in the King's Cup Race by Mr. Sayer (No.8). 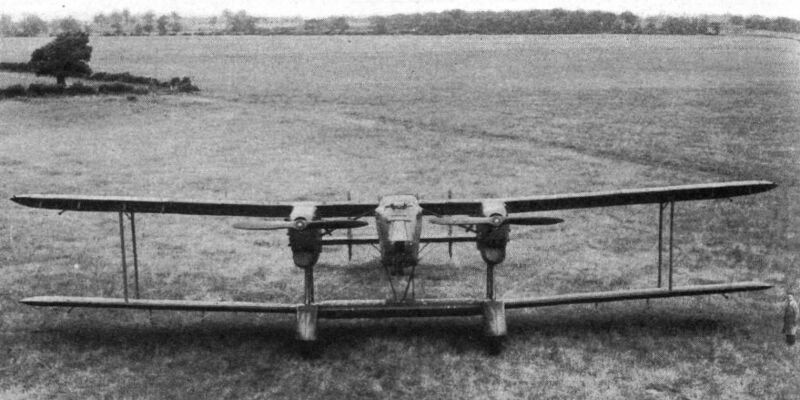 THE ANGERS "12 HOURS CONTEST": Regnier's Potez 43 (130-h.p. "Gipsy Major"). LAUNCHING OF THE CLUB'S FIRST MACHINE: Mrs. Leckie beside the Club's D.H. "Moth." The shield has the colours of the Royal Air Force. A HELPFUL LEAD: The Mayor of Hythe (Capt. 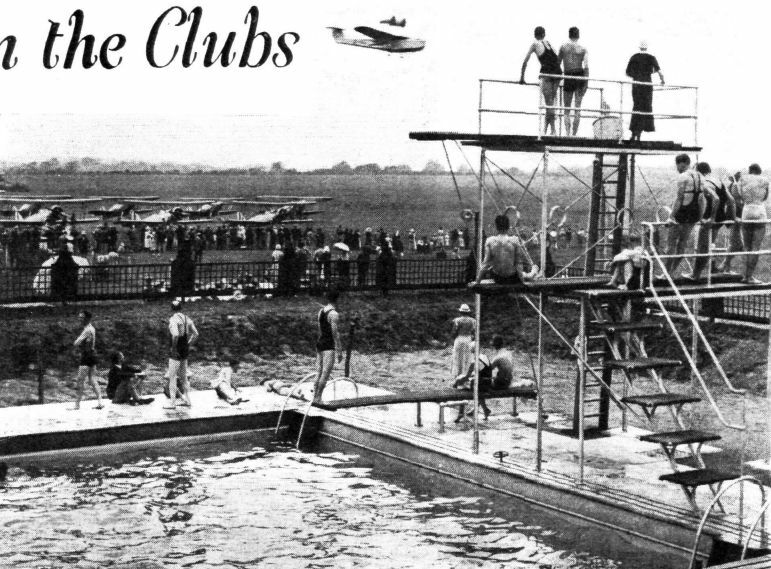 Few) leading the fly-past in one of the Club "Moths" piloted by Capt. D. Davis. ULSTER'S FIRST AEROPLANE : This picture, taken in 1910, shows Mr. Harry Fergusson's monoplane just before a trial flight. Note the "A.A." badge. 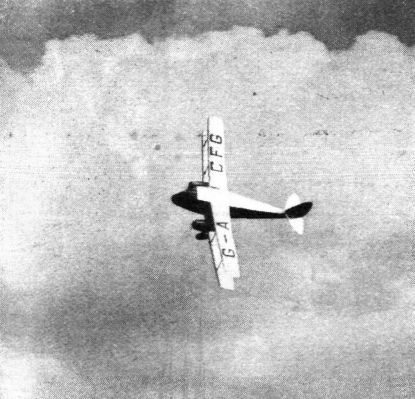 A NATIONAL AIR RACE WINNER: Col. Roscoe Turner and his "Wasp"powered Wedell-Williams on which he won the Bendix race from New York to Los Angeles in 11 hr. 40 min.